Loun Sopheara working with teachers and students on enrollments/application. CCAFO Management Team expresses their wish to thank Loun Sopheara who was a short-term employee working at the CCAFO English School. 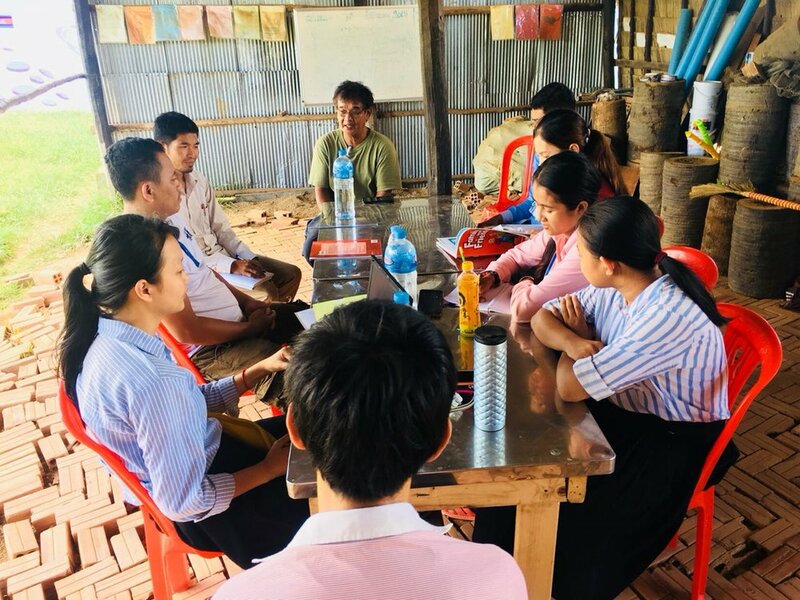 During his working period, Sopheara worked with all English language teachers and school principal reviewing the lesson plan and share his knowledge and way of teaching among teachers. We wish him the best. The following is the statement from Sopheara. My name's Loun Sopheara. I'm the teacher of the English language. CCAFO Management Team would like to thank Koem Davy who was one of great teachers working and shared her knowledge with students. Together with all teachers and management team, she did very good job during her short-term employment with CCAFO. We hope to work with Davy in the future and wish her the best. The following are the statement from Koem Davy. My name is Koem Davy. I’m a university student and spent my summer internship working with CCAFO as the local English language teacher from late May 2018 to end of July 2018. At the CCAFO English Center, in the morning, I worked as a teacher and in the afternoon I helped to do some administrative work including students’ progress and attendance records. For the first time when I started with this project, I did not really know to do because I did not have any experiences in both teaching and working. Starting from the first day of working, I needed to observe other teachers’ teaching and to understand how they teach the kids here. I quite understand a lot about it and know that becoming a teacher is not that easy. Moreover, I have learnt so many things about administrative work especially working as a group. I learnt that working as a group here require to share experience/knowledge and every one of the group work and collaborate all together because one work cannot achieve unless they are cooperating. What I love the most about working here are the kids. The kids are easy going and friendly. Besides, the coworkers are also nice and friendly and I liked working with them. After finish working here, what I miss the most maybe about the time that I used to teach the children in the class. This job taught me that each and every work demand every person’s commitment, and motivation. Last but not least, I would like to thank Cambodian Children Advocacy Foundation Organization that gave me this opportunity to serve the communities. I wish that this school will continue to open forever! My name is Kuch Chunboramy, a sophomore at the American University of Phnom Penh. I worked as an English teacher and administrative staff at the CCAFO English Center for three months as part of my summer job. It had another meaningful experience with the Cambodian Children’s Advocacy Foundation. I really like the kids here. They are very friendly, funny, and I feel at ease and comfortable around them. I also get to learn a lot about administrative works and how an NGO functions. All the teachers there are nice too and I really enjoy working with them. Most importantly, I am sincerely grateful to the Cambodian Children’s Advocacy Foundation Organization for giving a college student like me an opportunity to gain such a precious experience. Photos highlight about Chunboramy activities. Sopheavy is a professional local English Teacher who has the capacity to teach advanced English level. CCAFO Management Team would like to express our sincere thank to her for effort and share knowledge with children. We wish her the best and hope that one day she can join us again. Following is her review.